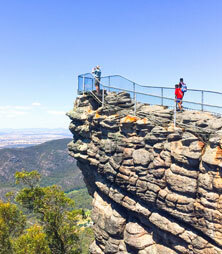 Experience the majestic splendour of the well-known Grampians. This unique area offers spectacular scenery with mountain peaks over 1000 metres and numerous species of wildlife. We visit Mafeking, the site of Victoria's last gold rush, where in 1900 over 10,000 diggers lived under canvas in search of their fortune. Throughout the year the National Park is ablaze with a seemingly endless variety of wildflowers. It truly is a botanical paradise. Before European settlement in Australia, a large part of the Grampians was occupied by Aboriginals. 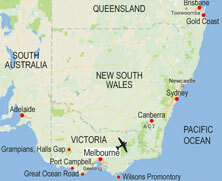 Today the region contains the greatest concentration of Aboriginal rock paintings in Victoria. Our walks take us to Mt. Zero, the Wonderland and the Mt. William. 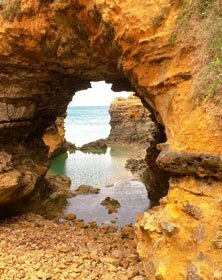 Experience the Port Campbell and Otway National Parks, a perfect location for a few days of fascinating coastal walking. We explore long stretches of unspoiled coastline and walk up into the hinterland, which provides shelter for an array of unique wildlife. We visit the famous 12 Apostles, huge limestone pillars worn and weathered by the stormy southern ocean. The magnificent Melba Gully is the jewel of the Otway's and renowned for its dense forests of Myrtle Beech. 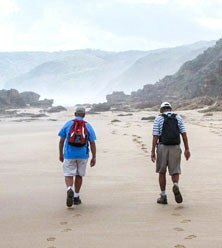 A highlight of time in the Otway's is the opportunity to walk 2 sections of the newly opened Great Ocean Walk. 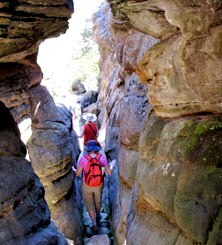 The trail goes through some previously inaccessible areas in the former Otway National Park. In these marvellous two regions we stay "in the best of both worlds" - dramatic mountain scenery combined with spectacular coastal landscape. We have chosen three lovely hotels, full of ambience and charm. The excellent cuisine in both regions allows plenty of space for indulgence! 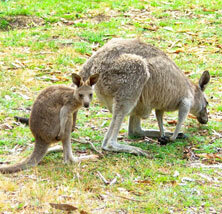 In the Grampians we spend 3 nights in Halls Gap in a 4 hectare green oasis on the edge of town. Our evening dinners are in three of the best restaurants in town where you have the opportunity to sample delicious home style cooking. 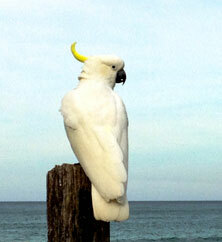 In Port Campbell we have 2 nights in newly established luxury villas. This delightful sleepy little seaside resort has gone through somewhat of a revival in recent times and it now hosts some excellent restaurants, which we shall sample during our stay. Our final 2 nights are spent just outside of Apollo Bay. Nestled in amongst 20 acres of beautiful rolling countryside all rooms have magnificent sweeping views of the coastline. We dine at nearby Apollo Bay, which has some of the best restaurants along the Great Ocean Road. 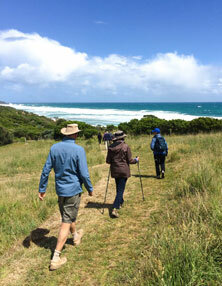 Departure dates have been arranged to allow both "The Grampians & Great Ocean Coastal Trail" and "Explore Wilson’s Promontory" walks to be combined. My eleventh tour with WGA in 12 years! People ask me which one I have enjoyed the most. I still can't decide. I have genuinely loved every one of them and the Grampians and Great Ocean Road was no exception. Such a great balance of strenuous and gentle exercise, beautiful and varied scenery, wonderful wildlife, exceptional travelling companions and fabulous cuisine! What more could you want! I can't wait for the next one! Thanks again Graeme. Graeme is a wonderful knowledgeable, encouraging, helpful, and understanding tour guide. He lent a hand when necessary and understood when a member of the group could not undertake an excursion. One part of the Grampians was harder than I had anticipated, but with his steading hand I managed to get to the Pinnacle which delighted me. His picnic lunches were delicious. The scenery, the colours, the flowering bushland and walking through the forest type glades were beautiful as was the Ocean and Twelve (-a couple) of Apostles. The accommodation was terrific and as were the restaurants where gourmet dinners and breakfasts were served. We had a great friendly group on our tour and "six degrees of separation" is getting smaller all the time. The friends we had in common with each other and our interests were amazing and some were talking of their next adventure with Walkabout Gourmet Adventures as they enjoyed it so very much. Thank you for a wonderful experience. Wonderful days starting in the mountains with a particularly informative indigenous centre visit at Halls Gap then an arduous tramp up to the Pinnacle. The Great Ocean Road was spectacular with places like Melba Gully allowing such a contrast. The country was at its greenest, the meals were delicious and even the heavenly cake made by Graeme was delightful. I had a wonderful experience with such good company. We really enjoyed the week. The walks were all interesting and well balanced although the first day was a challenge! The small size group was important also the ability to walk at your own pace with time to admire the view and take photos. The accommodation was comfortable and the restaurants top class. Graeme was an excellent guide, knowledgeable, encouraging and fun to be with. Graeme looked after us in extreme weather conditions, and the tour was as enjoyable as our Walkabout experiences in Europe. Keep up the good work! I write to thank 'Prevention' and 'Walkabout Gourmet Adventures' for a wonderful holiday, which I won last year in your 'Best walking Town in Australia' competition. 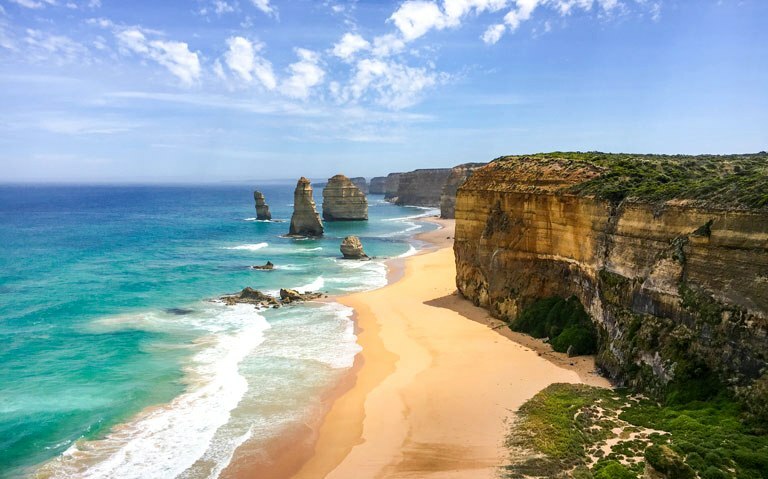 My husband and I have just returned from the pleasurable experience of an 8-day Treasures of Australia walk through the Grampians and Great Ocean Road and I must say the treasures were many. To enjoy these unique Victorian icons in such a personal way leaves one speechless. The magic of the Grampians, the beauty of the unspoiled coastline with its natural limestone monuments 'The 12 Apostles', the unforgiving ocean which caused many historic shipwrecks in the 1800's as well as the magnificent rain forests in the Otway National Park were truly awesome. Our accommodation was five stars and the word gourmet a true description of the restaurants where we enjoyed our evening dinners. This adventure has certainly whetted our appetite to experience another of Graeme Clarke and his knowledgeable team's walking tours in Europe and Australia. There is only one problem - the choice of which one. I encourage all your readers to call or email 'Walkabout Gourmet Adventures' for their 2012 brochure listing all destinations - they will be impressed by the variety available.